Blind Mary, by James Clark (1858-1943), was painted in 1881. It is an oil painting on canvas, measuring 64 x 90 cm, and is reproduced here by courtesy of Hartlepool Museums and Heritage Service. 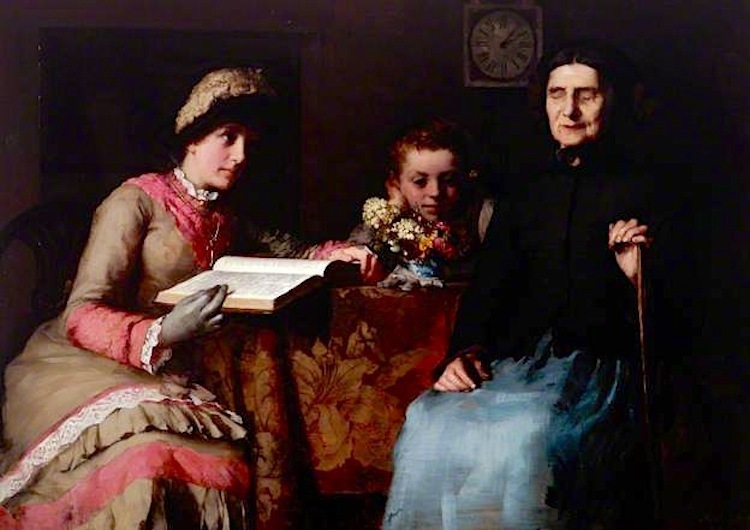 This domestic scene shows a young woman with pink and white trimmings on her dress looking up while reading aloud, as if to check on an older one who is listening. The latter is the Blind Mary of the title, for her eyes are closed, and she has one hand on her stick. She wears such a dark shawl that she almost fades into the background, while her pale blue skirt speaks of evanescence. Close to her, and seeming almost to be garlanded by some flowers on the table, a child too is listening, dreamily. Behind them, dimly seen, is a clock on the wall. This is a lovely picture of three generations, perhaps of the same family, telling of the passage of time, and the loss of youthful bloom and faculties, but with the sorrow of the passing years mitigated by the warmth of a close domestic circle. Naturally one thinks of Millais's famous Blind Girl, with its very different setting and its nuanced but unmissable natural imagery, not least that famous rainbow. There is no such brilliance here, only a quiet depth which goes with the greater subtlety of the colours. Less striking perhaps, it is equally moving in its own way. — Jacqueline Banerjee.